Observing what people wear on their feet can tell you a lot about a culture. A combination of custom and necessity footwear can also reveal a person’s status, profession and sense of style. Wooden shoes are the footwear of choice when wearing a kimono in Japan. Even trendy Tokyo stays true to its roots where you find pairs of these for sale everywhere. Morocco’s leather slippers are handmade, comfortable and work as well with a kaftan as they do with a pair of jeans. These were spotted in Marrakesh’s souk, where you will be spoiled for choice. 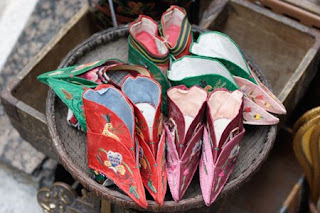 The ultimate example of the pain endured by women for the sake of shoes are small silk slippers worn for centuries by China’s elite bound footed women. They are now sold as souvenirs, in this instance at Hong Kong’s Cat Street Market. 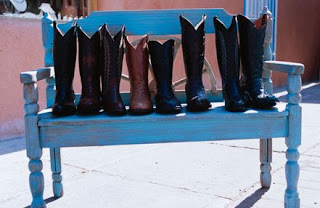 Nothing says American Southwest like a pair of cowboy boots. These were on display in Santa Fe, New Mexico. We in early days may be 100+ years used to wear wooden shoes too which we call "Khadau"
Many hindu priest in India still use Khadau. Someday I will post the pictures. 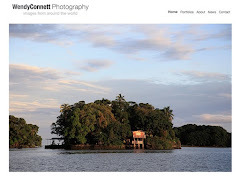 Do you try things on that you photograph? those would be wonderful pictures to see. Bella, I tried on the slippers in Morocco but said to myself I'll buy a pair later and never got to it. I have serious non-buyer remorse. Whenever you are in India please let me know. I wish traveling was my hobby turned job. Your this series is wonderful.. to judge the world thru a single object. Liked all your posts on this. HOBO is right. The priests in some places of India still use them. We in India, have variety of types of shoes. I have posted one of them here which I bought recently. Hobo, many hobbyists have made a career of it. You never know. Cuckoo, thanks for the link I'll take a look. Matt, Looks like I'll have to do a sequel. great post! the babouch and cowboy boots speak volumes, don't they? Great photos. Here in AZ it's flip-flops galore. Thank you. I see many women on the way to the office on the subway wearing flip flops with work attire who change into heels when they get to the office. This is a recent "trend" in the last few years.